So, what does the well-travelled Australian naturalist have on their bookshelf? A la cuisine hier: I carefully decanted and filtered the liquid from the batch of sour cherry liqueur I have had steeping on the kitchen bench for 6 weeks. It's a nice dark rosé wine colour and quite sweet, so useable in small doses already. I got just over a litre. Hardy souls could drink it now as the sugar masks the lack of balance that comes with a year or two's aging. The remaining undissolved sugar and pale vodka sodden sour cherries I have gently heated up to make a syrup to go in a sorbet or something. The cherries have imparted most of their colour and flavour to the liqueur, but I'll strain the remains and see how it goes. The result may be too medicinal to contemplate. In the Pantry: MICE! They are extremely stinky, but don't seem to have gnawed anything. I have only managed to catch one, an adult female House Mouse Mus musculus. I may have to borrow Pepsi. I reckon these three photos show glimpses that fit most anglophone notions of what romantic and picturesque France should look like. I can't decide therefore whether it is ironic or inevitable that all these properties are owned by incoming but well integrated anglophones. Does France Have a Drink Problem? The short answer is 'yes', and it has always had a hidden drink problem, but the problem has changed recently, and is much more openly discussed. 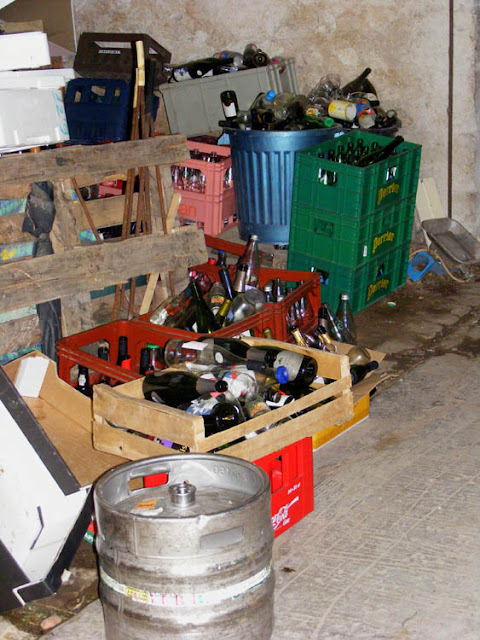 Alcoholism, liver disease and alcohol related cancers, heart disease and accidents appear to be significant killers in France, but nobody knows exactly how many people die of alcohol related causes every year, because the authorities have not standardised the data collected. The figure is probably somewhere between 30 000 and 50 000, with twice as many men as women dying of alcohol related causes, and nearly half of the deceased under 65. Alcohol related presentations at hospital Accident and Emergency clinics are definitely on the increase, as are hospital admissions due to alcohol related diseases (up 80% and 30% respectively in the last 5 years). I tried to get comparative figures from Australia, to give the French figures some context, but after a frustrating hour or so searching on the internet, it seems Australia does not present its statistics in the same way, so I can't compare apples with apples. 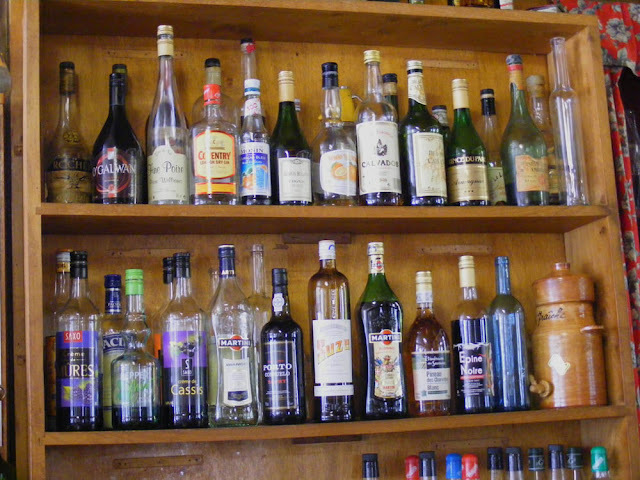 What is curious is that overall the number of people who drink alcohol is decreasing in France. This decrease is particularly striking amongst women. Older women and young women are much more likely than not to drink, but in the 30 - 60 year old age group, nearly half do not drink at all. A decade ago and earlier, wine was the tipple of choice (along with pastis type aperitifs if you were a man). Beer and spirits didn't get much of a look in. Most people drank a glass or two (often more) of wine every day, but it was mostly in company and with food. It wasn't perceived as a problem, but as an important part of French culture. 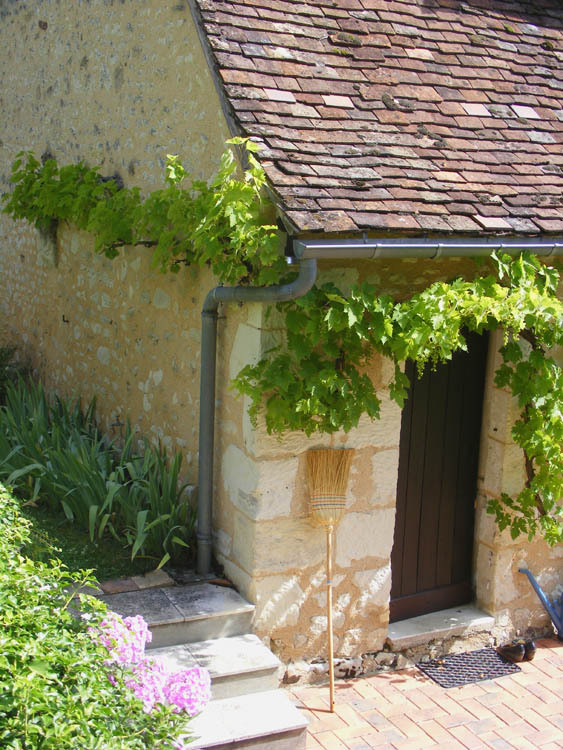 Being bien arrosé was a good thing (the phrase literally means 'well watered', and contains a sort of pun referencing the 'rosy glow' one gains after a glass or two and a good meal). A glass or two was good for the health. Until the 1980s no one thought anything of drinking and driving, but a very successful drink driving campaign has curbed the habitual nature of such behaviour. Many French towns have a character who in small town Australia might be known as the aging town drunk, but here alcoholism is rarely mentioned and I've had such people described to me more than once as spécial. In French, to describe someone as 'special' generally means that the person can be intensely irritating, but generous and tolerant allowances are made on the grounds of how talented, creative and artistic they are. Alcoholism and mental illness are considered part of their personality, the tragic price one has to pay for the once extra ordinary mind. My personal observation is that these individuals are known by the locals, looked out for and looked after and not violent or frightening in any way. What we do not yet have in this part of rural France to any great extent, but I am sure will come, is young binge drinkers. This is the new phenomenon that has France facing the fact that drinking can be a problem. Health warnings on bottles of alcohol were introduced a few years ago and the age people can legally buy alcohol raised to 18. The culture of introducing children to wine at a young age, in a family setting, seems to work just fine -- for wine. 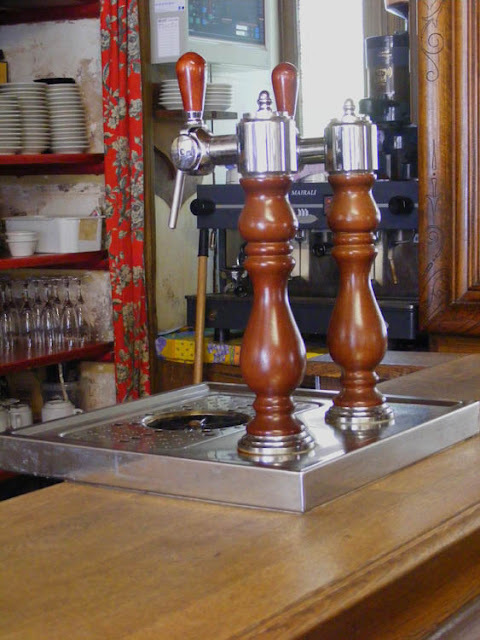 What the French hadn't counted on was the influence of travel and television, and their young people enthusiastically adopting beer and spirits, and the practice of drinking simply to get drunk. Drinking like this is often done in public, and is associated with violence and other anti-social behaviour. The drinking and the behaviour come as a package, learned from the UK and Germany in particular. You can tell it's now entrenched, as the Ministry of Culture has just approved the official French expression for binge drinking -- la beuverie express. A friend of ours, who works in the wine industry, recently told us a story about going through the checkout at the supermarket with her weekly shop. A kid in his early to mid teens was in the queue behind her. He put his stuff down on the belt and both of them went through the checkout. What our friend hadn't realised is that he had surreptitiously put a bottle of wine amongst her purchases, which went through as hers and she paid for. As she was exiting the shopping centre the kid tapped her on the shoulder and said 'Excuse me, but you have my bottle of wine'. 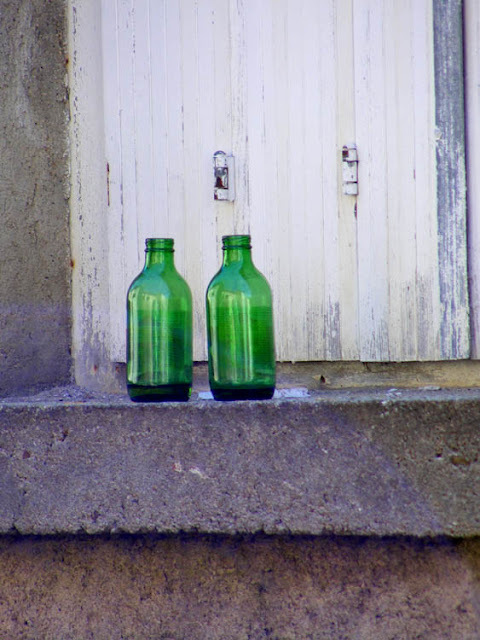 She tried to give him the benefit of the doubt by thinking that he had been sent by his mother for a bottle of cooking wine (it was in a plastic bottle and cost €2) but she is fairly sure that what he was actually doing was circumventing the possibility of being challenged about his age, and was just after some cheap alcohol for himself. She said it was extremely subtly done. When we visited Domaine Joël Delaunay at Pouillé with Jean-Louis and Suzanne in July this mobile bottling rig was parked outside the chai (where the wine is actually made). 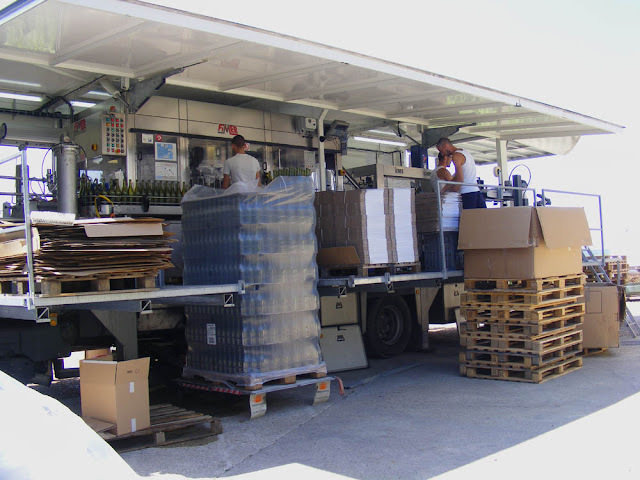 The winemakers around here are almost all small to medium sized and hire all sorts of equipment for a few days of intensive use rather than invest in machinery that sits idle most of the time. Non au feu rouge ! It seems I'm not the only one who reads the local council minutes. I mentioned a few weeks ago a plan to trial traffic lights on rue Chaumont-Patin from September. Someone clearly doesn't think they are a good idea. ERDF ('Electricity Grid of France') vehicles on their way to lunch approaching the pinch-point in rue Chaumont-Patin. The problem is that there is a bottleneck where the former Eglise de Notre-Dame-des-Echelles sticks out at an angle, making the main road out of town narrow. Those going up the hill and leaving town have right of way, but if you are coming into town you have to enter the problem zone before you can actually see if anyone is coming, so those with right of way frequently end up giving way to people coming the other way, through no fault of theirs. Probably what triggered this move to trial traffic lights was the destruction of a corner pillar at the old doctor's house by a truck trying to squeeze past about 12 months ago. 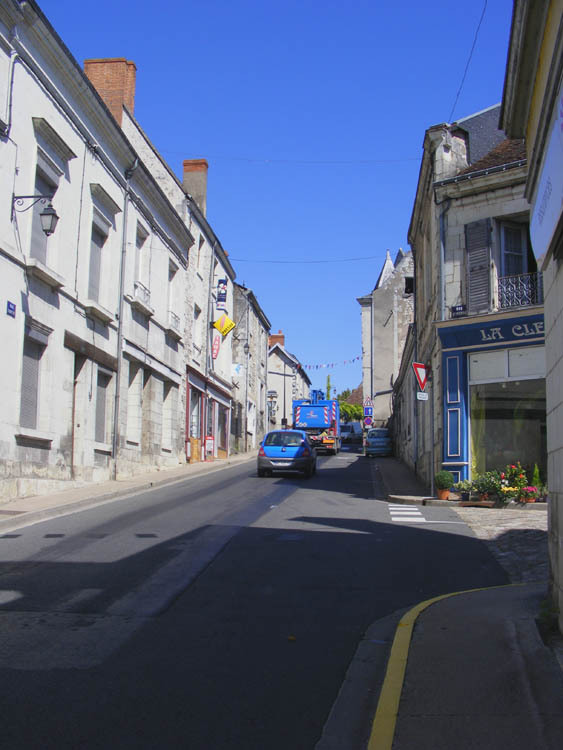 Heavy vehicles use this road a lot, as it is the main road to Loches and Preuilly does not have a by-pass like many towns in the area because vehicles have to cross the river Claise. Crossing the bridge brings them right through the middle of town. 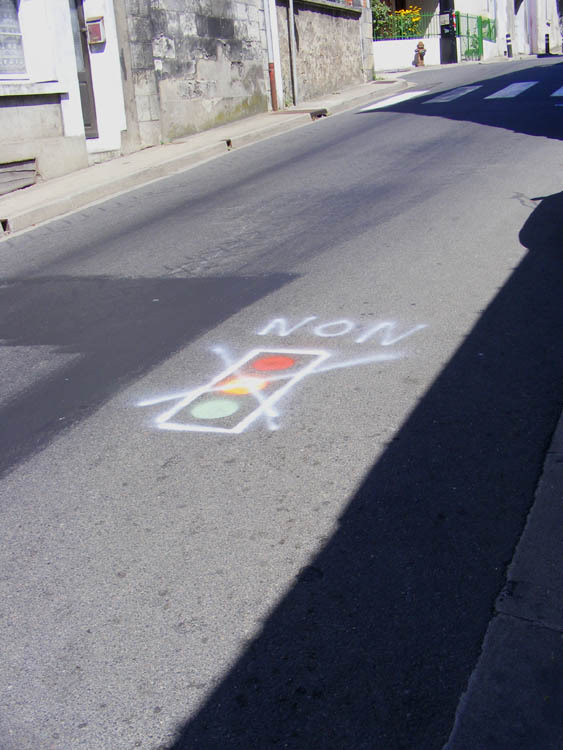 Moves to reduce the parking on the Grande Rue have already been put in place, so the traffic lights are part of an ongoing plan to mitigate the traffic issues. Someone in town doesn't want the traffic lights. Personally I don't see how the traffic lights will work. I think they will cause traffic to back up and exacerbate the problem, plus it may result in a certain amount of rat-running. 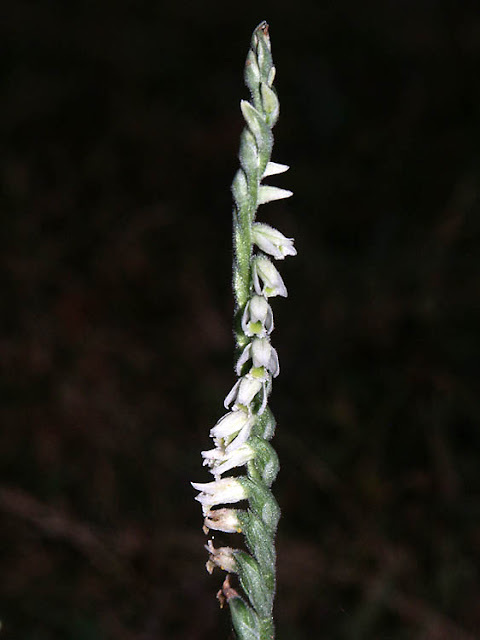 Remember to keep your eyes peeled for these tiny, rare and exquisite little orchids in the next few weeks. Autumn Lady's Tresses Spiranthes spiralis. Isn't that just the best name? The Dubious Dtella Gehyra dubia is a common gecko, widespread in the north east of Australia. Some observers are beginning to have concerns that the introduced Asian House Gecko Hemidactylus frenatus is displacing this native species. 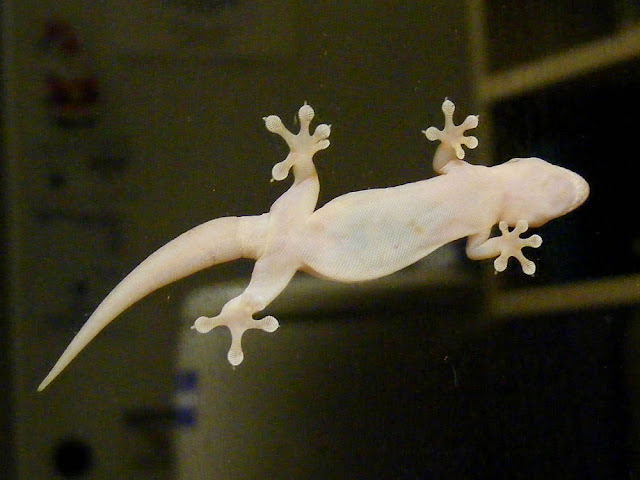 There are 60 native species of gecko in Queensland and one alien. A lot of them are 'house geckos' like this one. This particular gecko and her family have lived in my parents' house for years. She eats insects attracted to the lights in the kitchen and is most often seen on the window above the sink. Sometimes she will vocalise, making sharp chattering sounds. Click on the image to enlarge it so you can see the details of her toe pads and scales. 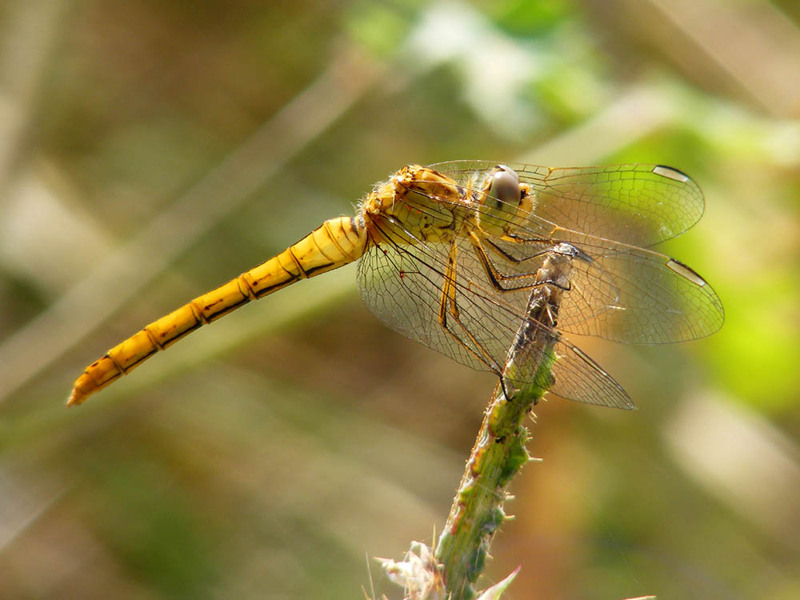 Ile de Ré Reflections: This female Moustached Darter Sympetrum vulgatum was photographed at the LPO reserve. Like all yellowy darters, she was not easy to identify, but I think her moustache and visible vulvular scale settle it. She has a number of orange mites attached to the veins on her wings. They are parasites feeding on the haemolymph ('blood') flowing through them, but they are probably not causing her much inconvenience. Click on the photo to enlarge it and you will see them. A la cuisine hier: Blackberry and Apple Crumble Tart. This was to use some blackberries I picked the day before, after doing my Boussay butterfly survey for August. No Australian ever refers to a coupe utility vehicle. 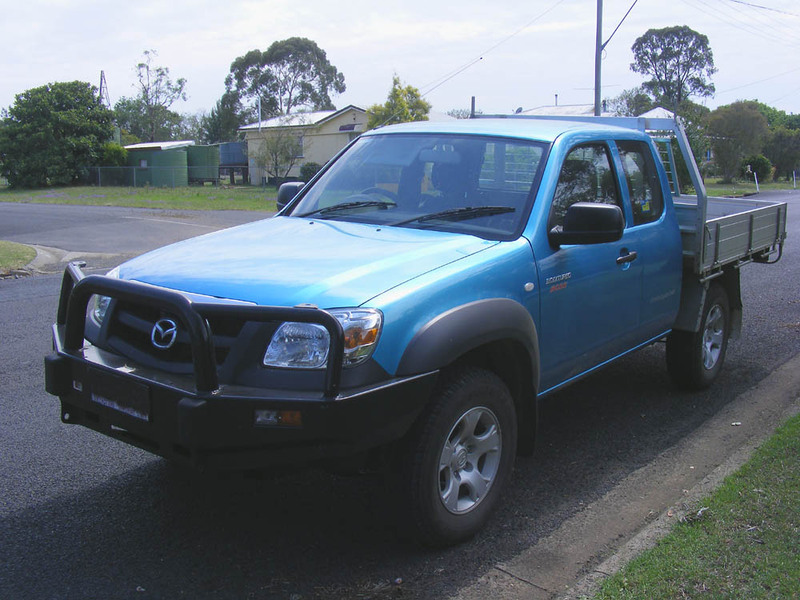 They are universally 'utes' and are a style of vehicle that has made its home in Australia. It is rare to see a ute in Europe, and in the US they have pick-ups. For an overview of the differences, see here. 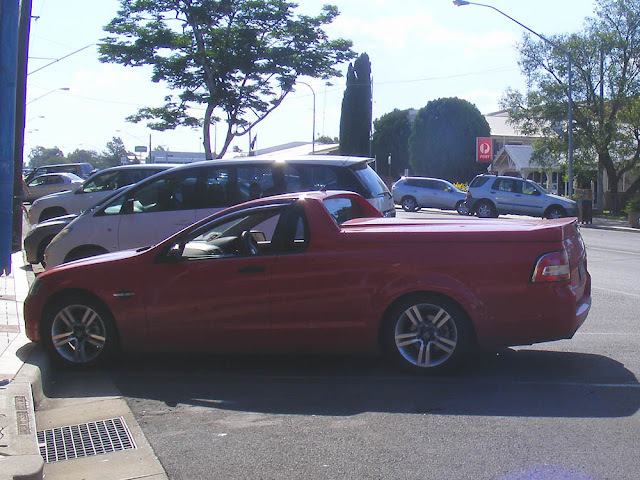 You simply cannot get more Australian than the ute. The number plate on this one had the strapline 'Real Australians drive a ute'. I was absolutely thrilled when my friend Trish L arrived at my parents' place in her ute to pick me up for lunch in December last year. 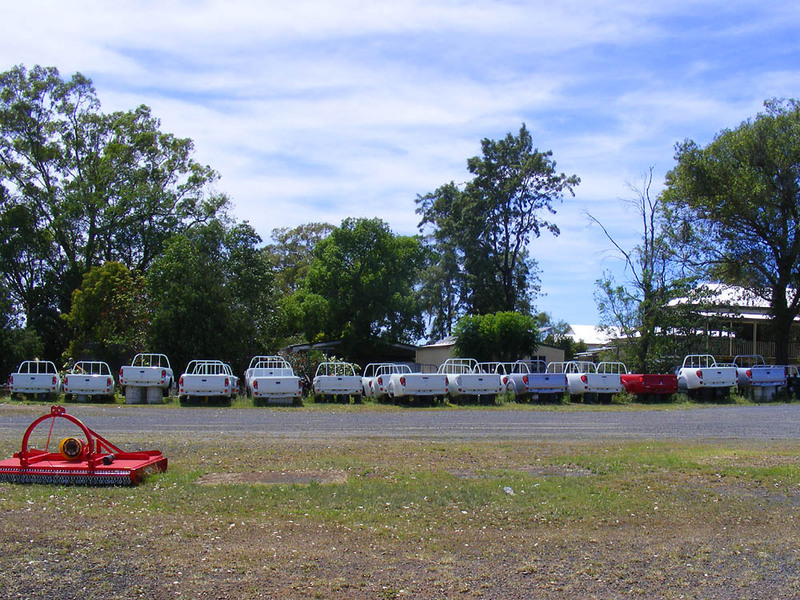 Ute backs lined up at a rural auto dealers. Are they waiting for cabs and chassis or have they been ditched in favour of the tray back style? Ile de Ré Reflections: One of the oyster raising areas on the island. Oysters are huîtres. 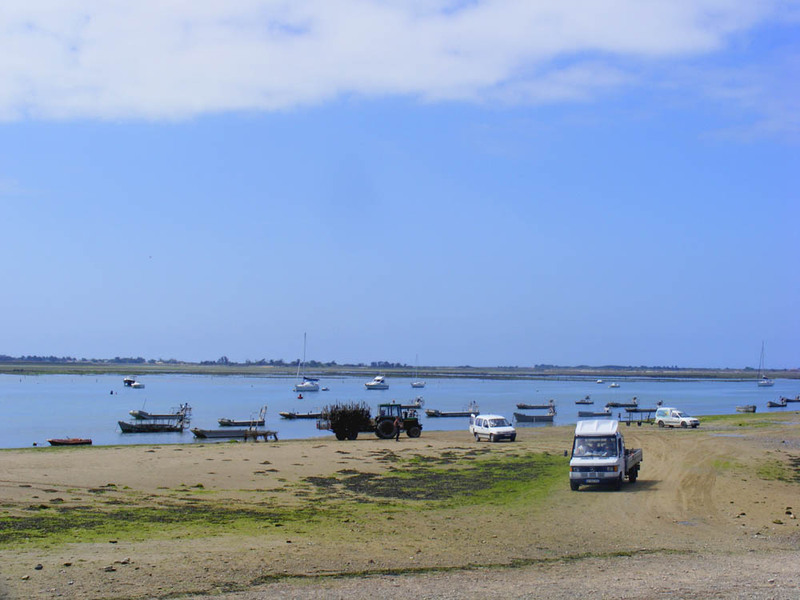 The oyster beds are known as parcs ostréicoles in French and oyster farmers are ostréiculteurs. They are the only people allowed to take vehicles onto the beach, but otherwise it is a public beach. The oysters are over the other side of the water in this picture, growing in wire cages. To harvest them the farmer lifts the cages out and loads them on to the flat bottomed boats, which are then run up onto a trailer and towed back to the shed. 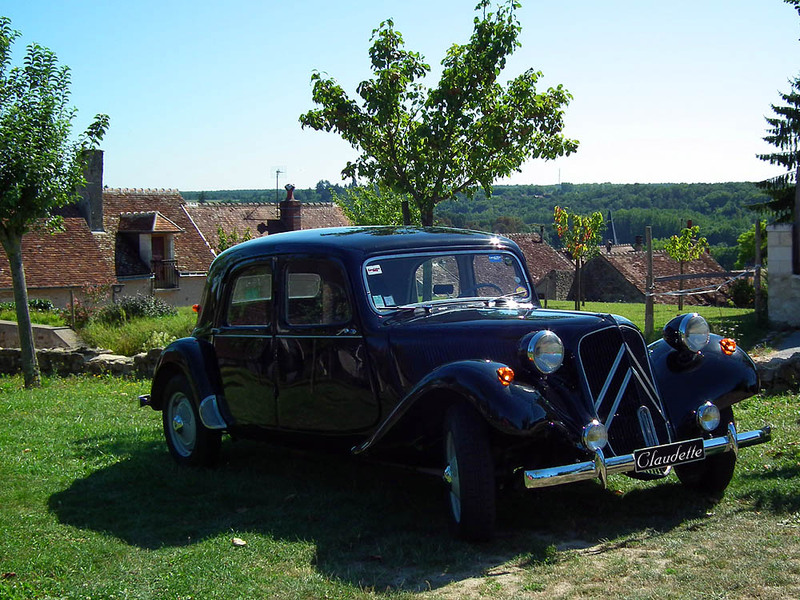 Première sortie: Claudette had her first proper little outing with clients yesterday -- a picnic for guests of Chateau Valcreuse. A la cuisine hier: Stuffed Tomatoes and Peppers -- cook a cup of rice; char 3 or 4 peppers on the gas; slice the top off 3 or 4 large flat bottomed tomatoes and scoop out the seeds and flesh; cut the peppers in half and scoop out the seeds; fry 400 - 500 g mince (I used pork and veal) then add a small chopped onion and half a dozen chopped mushrooms; chop the tomato flesh and add to the meat, cooking on a lowish heat for 10 minutes; add a teaspoon of harissa paste, a dollop of tomato paste, a crushed clove of garlic and some salt; mix the cooked rice with the cooked meat then spoon into the peppers and tomatoes; top with a little grated cheese and bake for 30 minutes at 200°C. The other day I was chatting with the owner of the little Vival supermarket in Preuilly. I happened to look up at the house opposite, and saw something I had never noticed before. 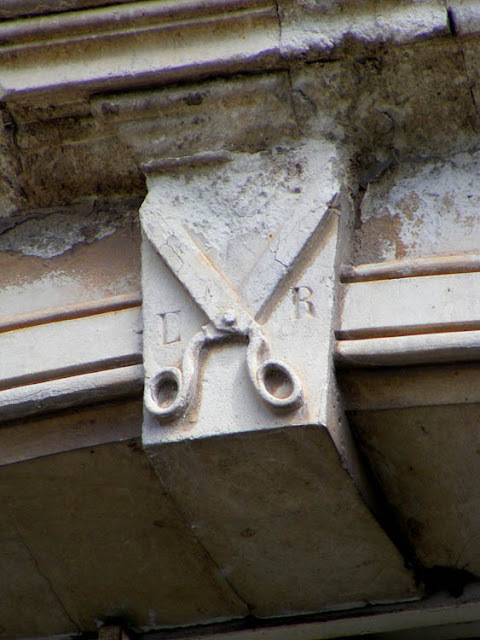 There is a pair of scissors carved into the window lintel on the first floor! This meant the house must have once been a tailor's or a dressmaker's, so I took some photos and consulted Roger Lezeau's notes on buildings in the town, published over several editions of Les Cahiers de la Poterne, the journal of the Société d'archaeologique de Preuilly (SAP). 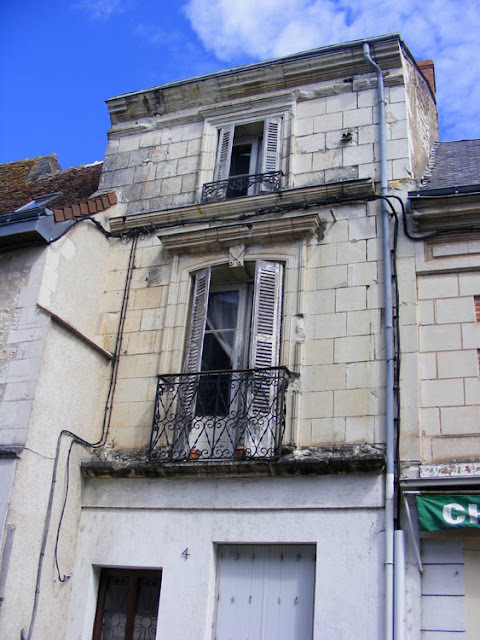 Roger says the house was the dressmakers Lieutard and his former apprentice Lucaire, but I am wondering if that is quite right. 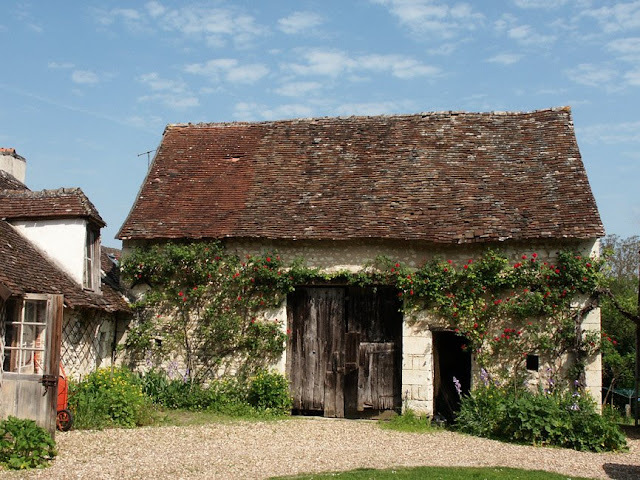 The house next door, according to Roger, was the millinery, fashion and haberdashery shop of Mesdames Ribotton and Lerat. The initials on the keystone are L and R, and I am wondering if he got the two buildings mixed up. In the early 20th century there were at least 5 businesses in the fashion trade, 3 of them in a row in this small section of street, plus a tailor two streets away and another haberdasher across the road. Now there is just one, a dressmaker, in a building only a few steps away from the original dressmaker's establishment. To practice your French comprehension and learn the difference between a tailor (tailleur) and a dressmaker (couturier) check out this video, part of a series by TV5MONDE called Merci Professeur. Beer O'Clock: I don't remember ever experiencing an unpleasantly hot wind in Europe before, but yesterday was hot, with a stifling breeze. Nevertheless, by 6pm yesterday Simon had given Claudette a second waxing and she is the shiniest car you have ever seen. I had dug the spuds. It was clearly time for a Leffe Blonde. Wildlife News: I was pleased to see a Southern White Admiral Limenitis reducta yesterday, lurking about one of the honeysuckles Lonicera sp in the orchard. This is a beautiful butterfly, a species having a good year this year (I never thought I'd be saying that about any species this year the way the first half of the year went!). Honeysuckle is its host plant, so hopefully I will get babies in due course. There is a second donjon in Loches, perhaps less well known than the imposing medieval structure, but nonetheless interesting. I thought it was a really cute idea to call the insect nesting and hibernation structure in the medieval garden at the big Donjon de Loches a 'donjon' too, rather than the more usual 'hotel'. 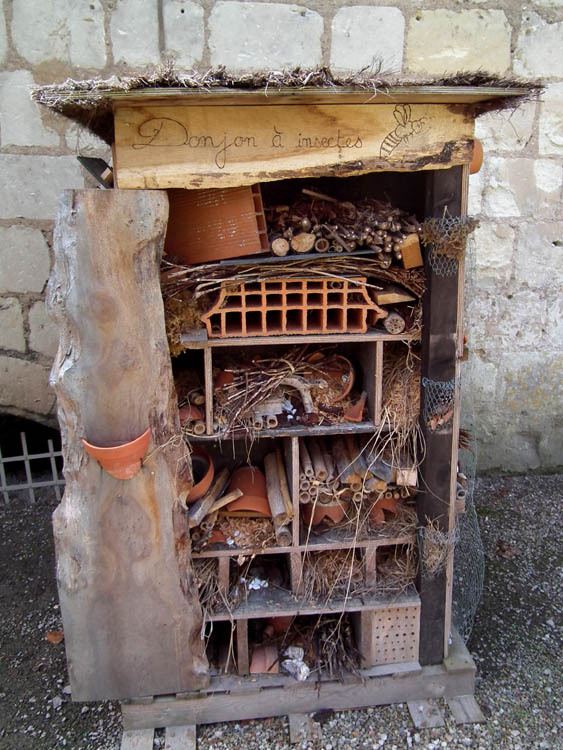 Donjon in French is not dungeon in English, but castle keep, and so it is the insect keep. I like that. They don't seem to have any solitary bees using the various holes designed for them yet, but I don't know how long the structure has been up. My advice is not to despair -- even if nothing seems to be using it in its first summer, it will get used over winter, and slowly, slowly, creatures will adopt it during its second summer. Food Crisis: A serious situation was developing yesterday in Preuilly. Both depots de pain had run out of bread by midday, and it was the baker's day off, so the boulangerie was closed. To top it off, the butcher had run out of sausages. He said he had been so busy he hadn't had time to make more. It's August and there are still lots of visitors in town. The weather remains superb, sunny and warm, so the barbecues are out. Luckily I had some tortilla wraps in the pantry and some sausages in the freezer. Claudette has arrived home after her 4 months with Jean-Louis J-L the Traction Doctor and his mate Michel the panel beater. We met Michel 5 weeks ago when we drove over in convoy with J-L's Traction and spent a morning deciding on the work to be done, and the methods to be used: door fit was discussed for quite some time because the back passenger side door only fitted where it touched - although it would lock, there was daylight still visible around the edges. 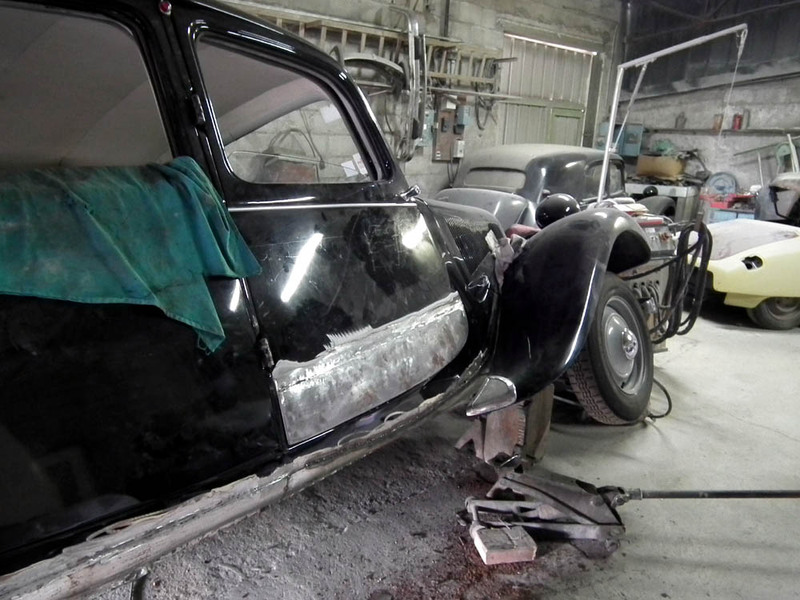 We also discovered that her rust problem had been made worse because someone had tried to disguise it by covering it with fibreglass and respraying. New sill and door bottom being made. 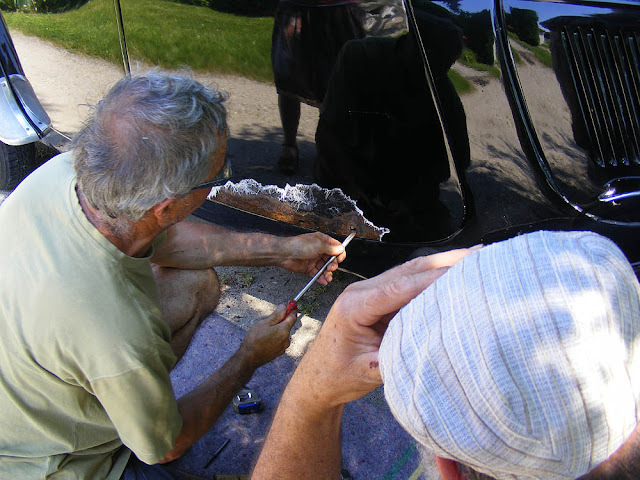 There are still several small things to do, such as add wing mirrors and remove some stains from the upholstery, but we are really happy with the results so far. Jean-Louis' work we already knew from past experience can't be beaten for getting your Traction in tip-top condition. We were super impressed by Michel's rust removal and re-hanging of the doors, which involved remaking the passenger side sill and the bottom of the front door, plus fixing some other smaller rust holes and paintwork to blend in with the existing black (There are apparently 5 shades of black that Citroën used over the years. Who knew?!). It's a magnificent job, once again by someone who knows Tractions well. 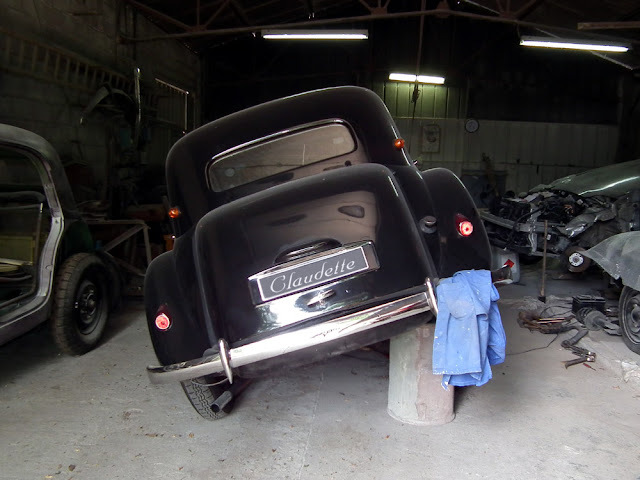 Claudette in La Guerche, yesterday. Yesterday morning Simon washed her and gave her a first coat of wax and I've vacuumed her carpets. 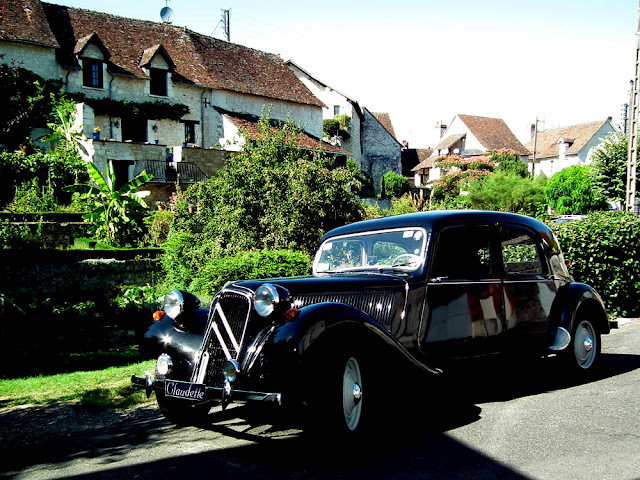 To celebrate her arrival we took her out on a photoshoot, stopping off in Le Petit Pressigny to pick up our friends Tim and Gaynor. We timed it really well, as they had spent the morning nettle bashing and were exhausted. A nice relaxing run in the country in a classic car was just what they needed. 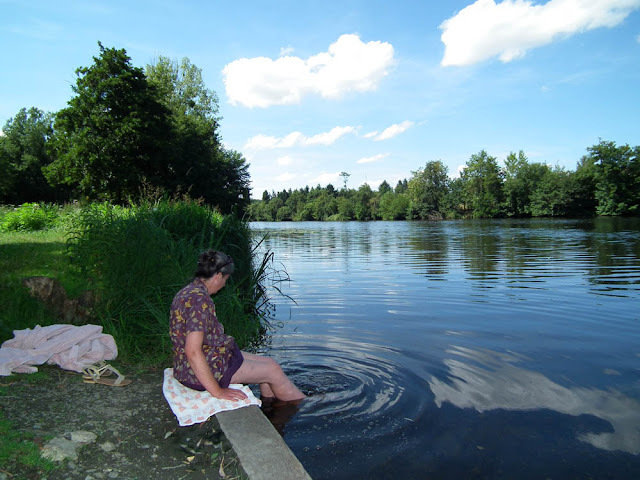 Claudette in Le Grand Pressigny. Our final challenge is to solve the brake drum problem. At the moment she is sporting a pair of brake drums that belong to J-L, because the new ones we bought are not properly round. So far the manufacturer and the supplier are not responding to customer complaints and we are not the only Traction owners in this position. My guess is that as there is only one manufacturer of Traction brake drums we will keep the ones we purchased and pay extra for someone we trust to re-machine them. France is famous for its cheese, and quite a few French cheeses are distinctly aromatic. 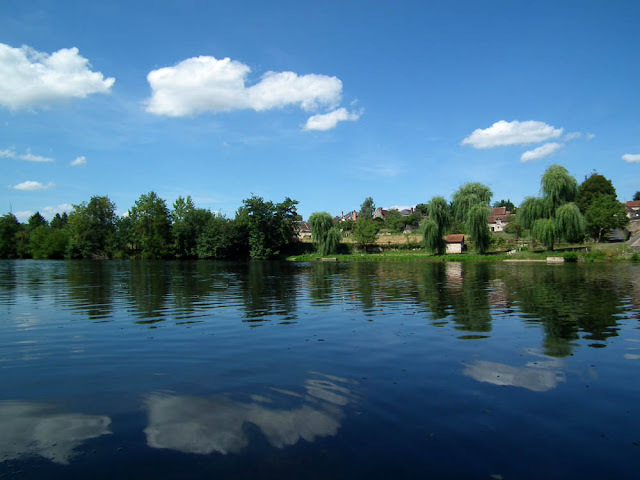 One of the stinkiest comes from the area between Deauville and Lisieux in Lower Normandy. Simon loves to tell people the story of us spending Christmas in the area and taking a block of the local Pont l'Eveque cheese home on Eurostar. The other day he announced that the fridge smelled, as if there was stinky cheese in there, but he couldn't see the source of the aroma and was mystified. Eventually I remembered that I had bought a Petit Pont l'Eveque some days earlier. It was unopened, and hidden under something else, but after a few days in the fridge had completely stunk it out. We happily unwrapped it and ate it and the fridge problem disappeared. A clear win-win. There is a very fine line between good stinky and bad stinky with cheese. Once the lactic aromas go over a certain level or develop in a certain way the cheese turns from being a delicious treat to something disgusting that turns the stomach. But the cut-off point between delicious and disgusting is different depending on where you were raised and what foods you have been exposed to. The French anthropologist Claude Lévi-Strauss had quite a lot to say about this particular aspect of our approach to food and how our attitudes are culturally acquired. He points out that these distinctions are entirely learnt, and not instinctive or innate as one might think. He illustrates his point at one stage by relating how, in the days after D-Day, American troops would occasionally encounter fairly whiffy dairies in the Norman countryside. To the unsophisticated Americans, who had never been exposed to anything more challenging than processed cheddar, they assumed the dairies were full of dead bodies, and burnt them to the ground. They were revolted and wanted to eliminate the smell. 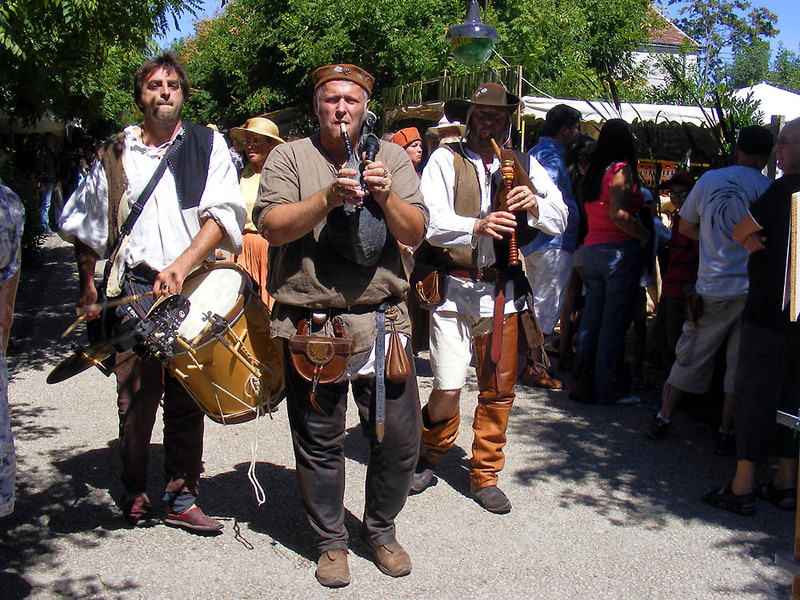 L'Epopée Médiévale (The Medieval Epic) is a sort of free flowing outdoor performance by co-ordinated troops of semi-professional re-enactors, supported by local people and the staff of the various historic monuments in the town where they are performing. 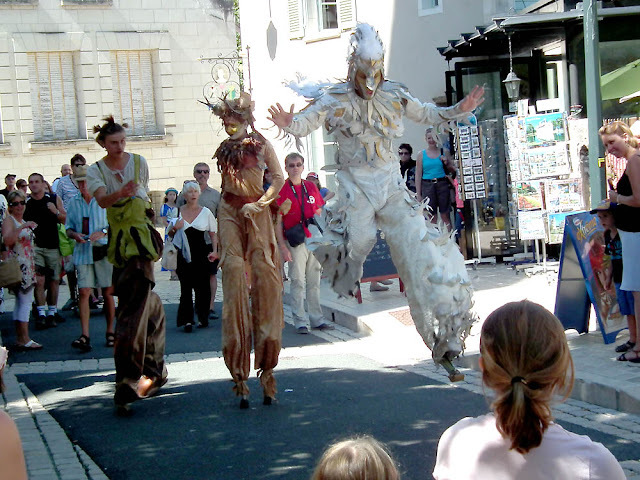 For the last couple of years it has been staged in Loches over the Assumption weekend. 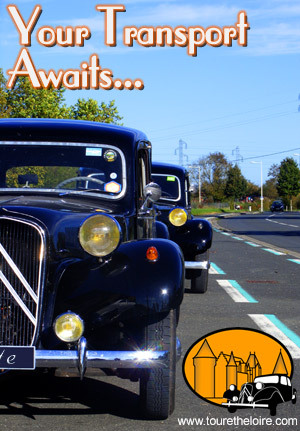 Assomption was on a Thursday this year, and although the Friday isn't a holiday, many people took the day off, faire le pont in traditional French style, thus making it a long weekend. These mummers may be powerbocking but they hark back to a pre-Christian tradition, and some of them are genuinely scary. We had never been to this event before, but this year we had visitors and decided to spend the day in Loches on Thursday. 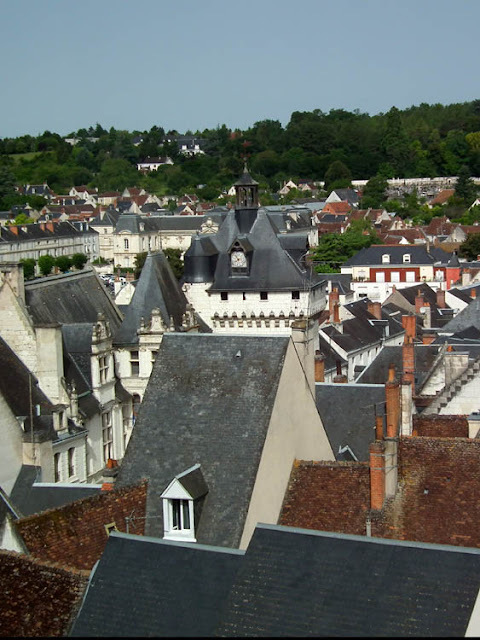 To be honest, we'd forgotten about the Epopée, and just wanted to show Jon and Rosy a charming small town with good medieval and renaissance buildings and go to a good restaurant for lunch. 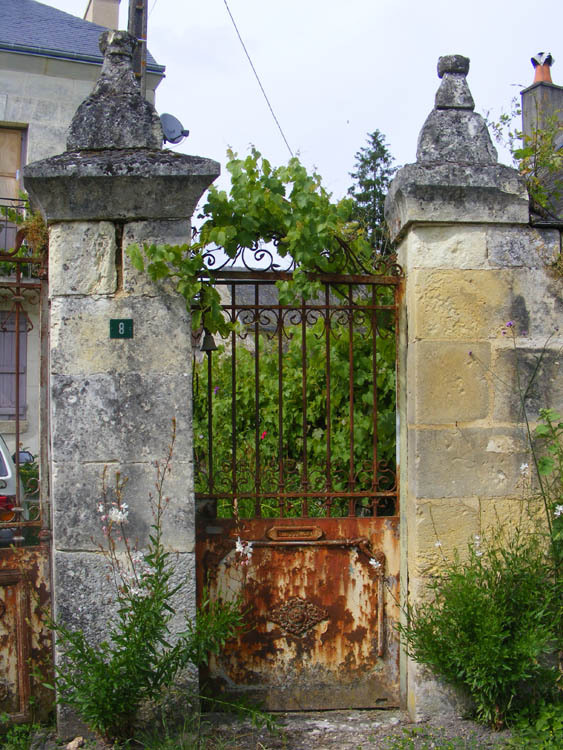 The Epopée was free unless you wished to enter the grounds of the Logis Royal or the Donjon. Most of the stalls selling medieval wares were in the free zone up on the citadel near the church or in front of the Donjon. If you wanted to buy a medieval costume or accessories, there was plenty of choice, all taking a very professional attitude to authenticity. The tented encampment with trebuchet demonstrations and 'learn how to wear armour' sessions were in the grounds of the Donjon. On a normal day you don't need a ticket to get into the park around the Donjon. I am aware that the lack of free access to this area is resented by some visitors who don't think it is value for money at €9 a head (a combined ticket that gets you full access to the Donjon and the Logis Royal). The ticket booths are set up at the gates of both buildings and you get a stamp which you then just wave at the person on the gate at the other location. Luckily for us, the guys at the entrance recognised me and the four of us got in for €5 a head, which I thought was perfectly good value. Once in we decided to opt for the medieval fare for lunch and had tranchoirs (basically open sandwiches with cured meat, slabs of cheese, gherkins, sultanas and nuts). We passed on hypocras or the various fairy or hobbit elixirs, and just went for beer though. Later we went for cocktails at Le Caravage, which were, as usual, superb and extremely good value whether alcoholic or non-alcoholic. Guards at the Porte Royale, the only entrance to the citadel of Loches. These guys come from the re-enactment group Medio evo. Being an erstwhile member of the Costume Society, I am fairly beady when it comes to spotting the anachronisms and anyone 'doing a plastic' (as the English re-enactors call it). I was most impressed by the quality of the costumes here and the way they were worn. Where manmade textiles had been used, they had been chosen carefully so they had the right weight and fall. There were a few modern touches, but of the sort that can be forgiven if they are done discreetly (modern prescription spectacles, kids in modern shoes, spring-loaded stilts). Most of the costumes had been at least partially machine stitched, but when it really mattered they were hand stitched, and everyone accessorised carefully, with some excellent belts, purses, weapons, head gear and foot wear. All the costumed characters were only too pleased to chat about their roles and be photographed. They were also fantastic at involving kids in the crowd in the performance and generally entertaining whilst staying in character. A la cuisine hier: Stuffed Mushrooms and roasted vegetables. Shirley Conran is a woman of great common sense, but she is wrong about mushrooms. Gooseberry Crumble. I keep a jar of crumble mix in the fridge so I can whip up a fruit dessert in no time. Jean's gooseberries were a real treat. I had forgotten what a distinctive flavour they have. Served with proper homemade custard of course. 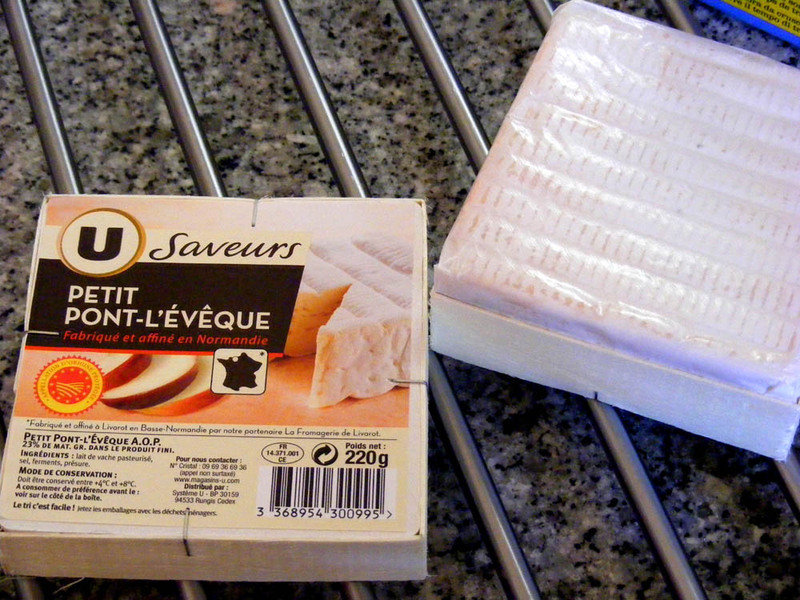 I'll be able to make fool with the rest today, but I have to wait until the laitière delivers some cream at lunchtime. Carparks are difficult to make attractive whilst continuing to maintain functionality. The small shopping centre in the town where my parents live has gone to some trouble to improve the situation. 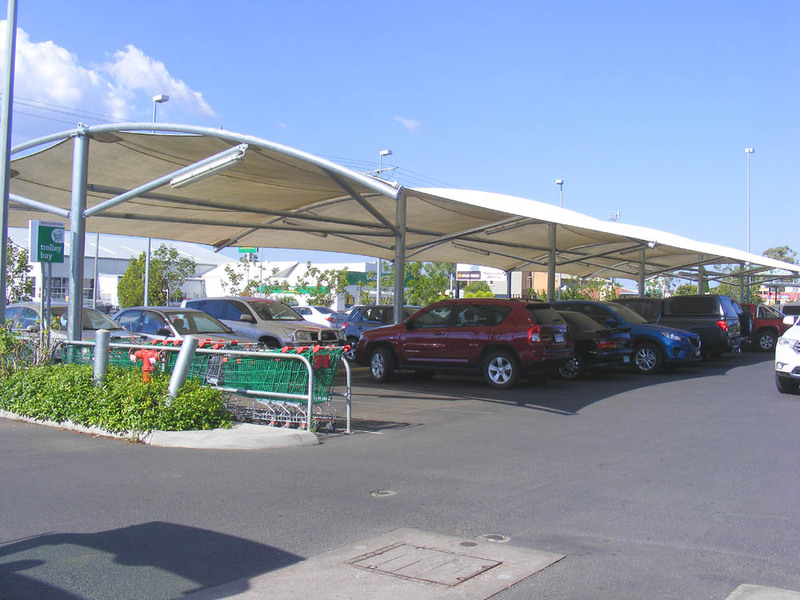 I guess they could have planted some trees, but the shade sails are not a bad solution -- they certainly look smart and practical. 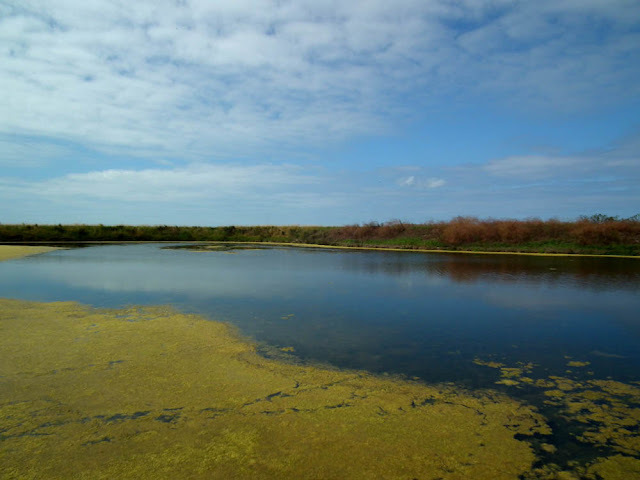 Ile de Ré Reflections: A pool in the salt marshes, part of the Réserve naturelle. Annual Hay Bale Migration: The annual hay bale migration is upon us, with the great beasts present in many fields. I've recorded at least five species and noticed that they've started aggregating at strategic points. Once this starts happening the local farmers need to keep their wits about them. I've noticed an increasing number of farm vehicles that have clearly been hijacked by groups of hay bales wanting to move more quickly from their summer grazing to their winter farmyard stacks. Once they start lining up in a regular fashion across the field I reckon the farmer needs to be particularly careful, as this change in behaviour heralds their intention to move. Goosegogs: The lovely Jean from Baking in Franglais called over yesterday afternoon delivering English gooseberries and her homemade strawberry and redcurrant jam. We love gooseberries, but they don't grow here (the plants succumb to mildew very quickly). I feel a fool coming on. Guests: Our guests Jon (Simon's brother) and his wife Rosy have gone home. 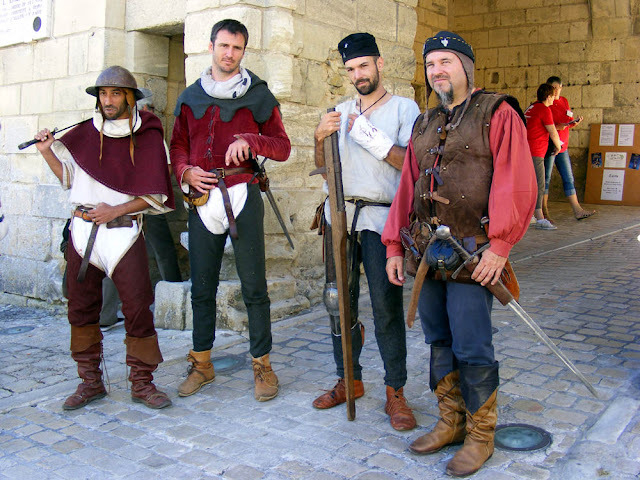 We sent them on their way after 3 days of eating and drinking and a bit of medieval culture. A la cuisine hier: Vietnamese Summer Rolls. I'd never made these before and now having done so, I would highly recommend you give them a go. They aren't nearly as difficult as you might think, and they are light and delicious. Maybe not to the standard Chez Kim, but good and tasty, sort of crunchy summer comfort food. I will have to make them again, partly because I need to practice rolling them up tight, and partly because I have a packet of 40 galettes de riz (rice papers) from the Paris Store to use up. The Brigalow Belt is one of Australia's biodiversity hotspots. It forms a band of wooded grassland stretching from tropical Townsville in the north, inland and beyond the New South Wales border to join the semi-arid temperate woodland of the Pilliga. Brigalow is a type of wattle (mimosa) Acacia heterophylla and the bioregion takes its name from this dominant species. 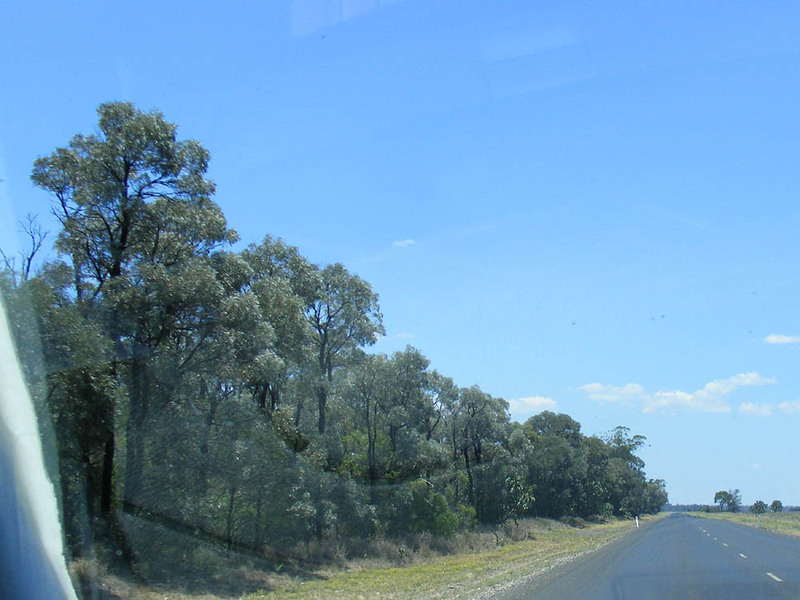 Other important species are Belah Casuarina cristata, Poplar Box Eucalyptus populnea, Narrow-leaved Ironbark Eucalyptus crebra and Wilga Geijera parvifolia. 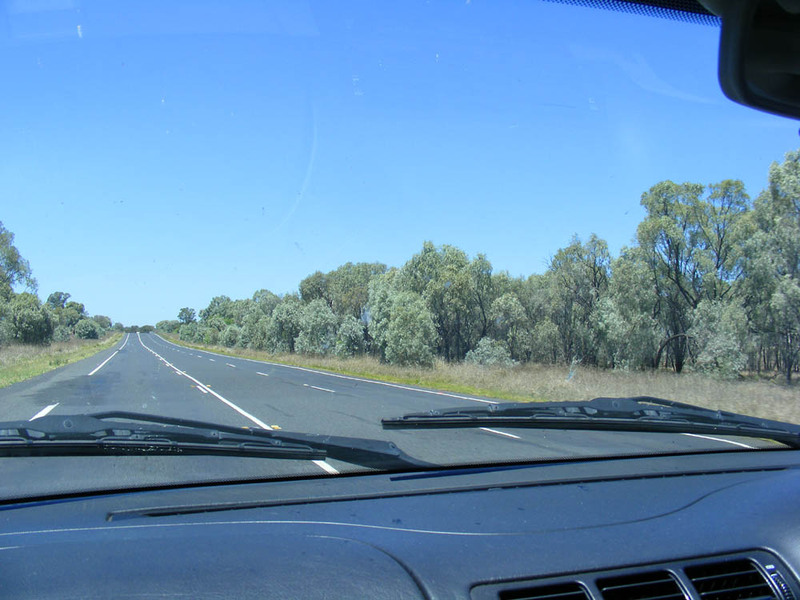 Driving through a beautiful silver leaved patch of Brigalow, south of Gilgandra in north western New South Wales, in December last year. Up until the Second World War, government policy either opposed wholesale clearing of this vast woodland, or, in the interwar period, were hampered by having to deal with the invasion of prickly pear Opuntia spp, which had a distribution that more or less coincided with that of the Brigalow Belt. After the War though, conservation issues were sidelined and the land was considered ripe for exploitation. Pastoral leases were granted which depended on clearing the land within a certain time limit in order to fulfill the conditions of occupation. 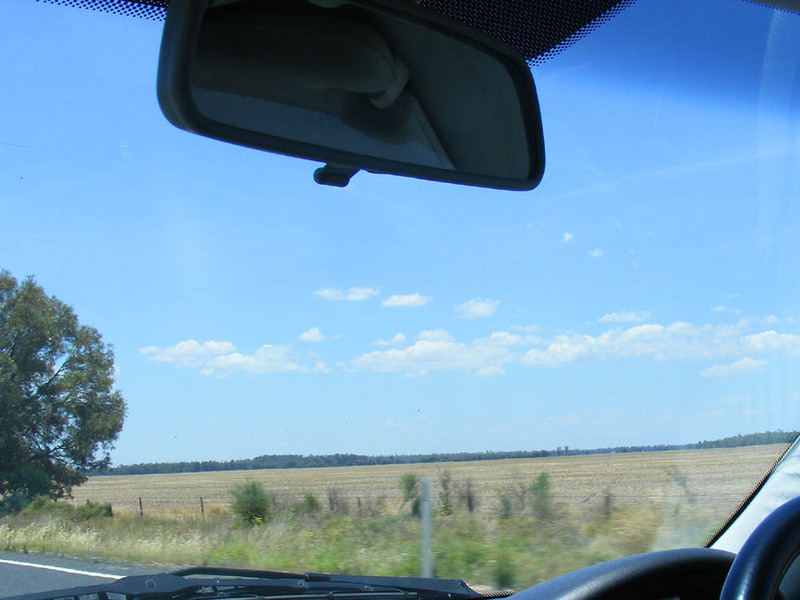 Large areas were opened up for broadacre farming and cattle grazing. Things really escalated when Joh Bjelke-Petersen became Premier of Queensland. He developed a technique of clearfelling using a heavy chain pulled between two bulldozers -- a crude and brutal method typical of the man. Much of his personal fortune was based on this 'property development' activity. Others followed suit and applications to clear the land were never turned down. 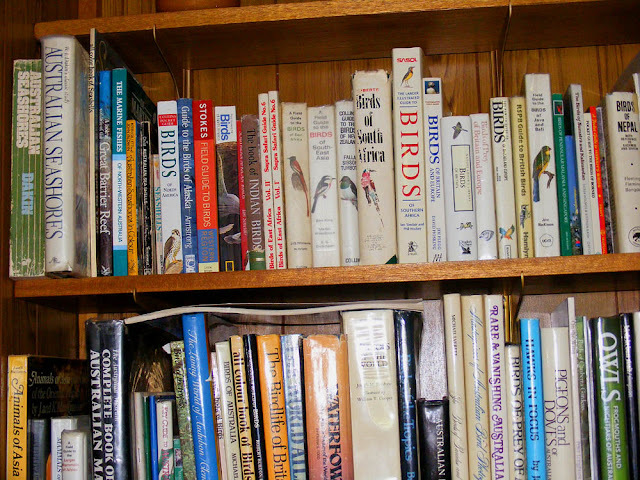 Finally, legislation was introduced to bring the destruction to a halt, but there was such a long lead time until the legislation was enacted that the rate of clearing increased by 50% every year for the couple of years before we left, as landowners panicked before the rules tightened up. As a consequence, most of the Brigalow Belt has been cleared in my lifetime, and living as I did on its eastern fringe, I watched it happen. 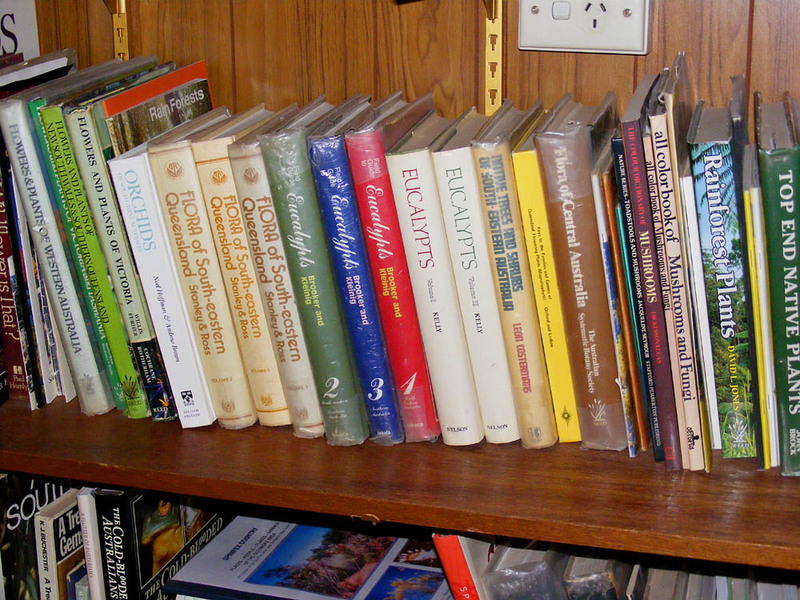 In the 70s and 80s the conservation focus was on the more glamorous wet old growth eucalypt forests and temperate rainforests of Tasmania and the New South Wales hinterland. Backward, conservative, corrupt Queensland was considered a lost cause and virtually no one rallied to defend the Brigalow. ...but then there's a break in the trees and you see how open the country has become. When you drive through it you don't get a sense of how much has gone. 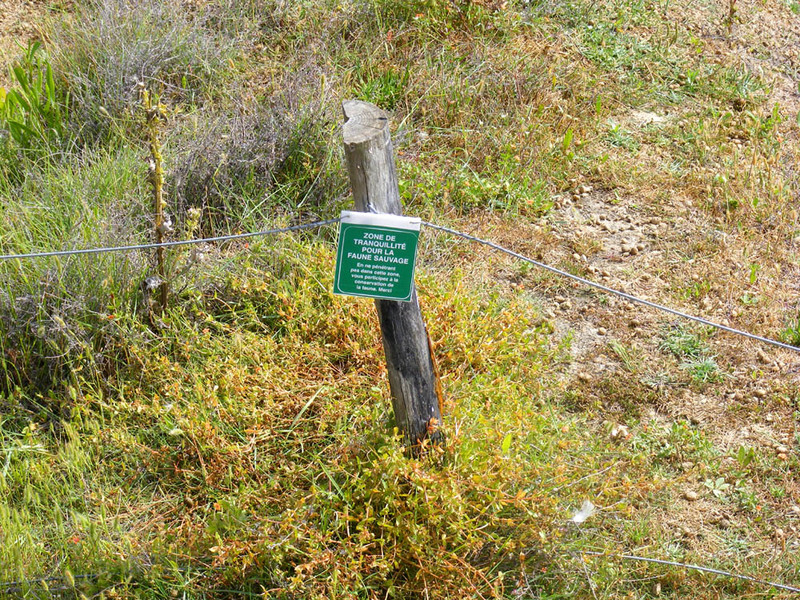 The roadsides have mostly been left intact, to form more or less useless ribbons of original vegetation. It is only when you look at the satellite images that you see that the dense stands of brigalow that line the roads are a facade, hiding truly vast paddocks of 'improved' pasture or cereal crops. And now it's the heart of the coal seam gas mining activity in the country. Does the irresponsible short termist exploitation of this special area never end? 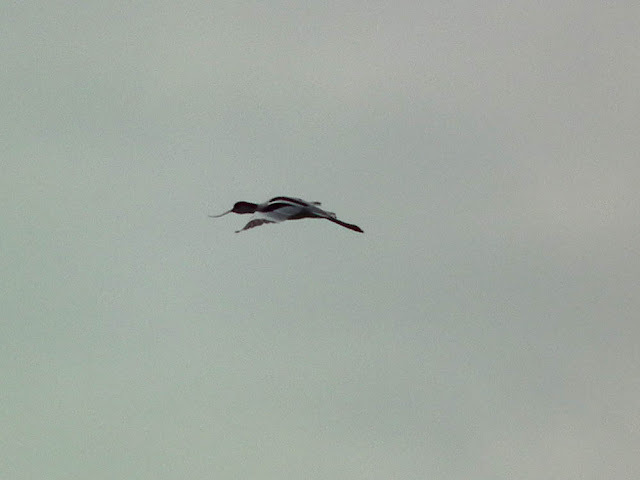 Ile de Ré Reflections: Proof we saw an avocet. This is one of the clock faces in the Tour de l'horloge over the Porte Picois in Loches. The Porte Picois is one of the Renaissance entries to the town of Loches, forming a gateway in the third (outer) defensive wall. It was built at the order of Francois I between 1535 and 1543, and is now the Hôtel de Ville (Town Hall). 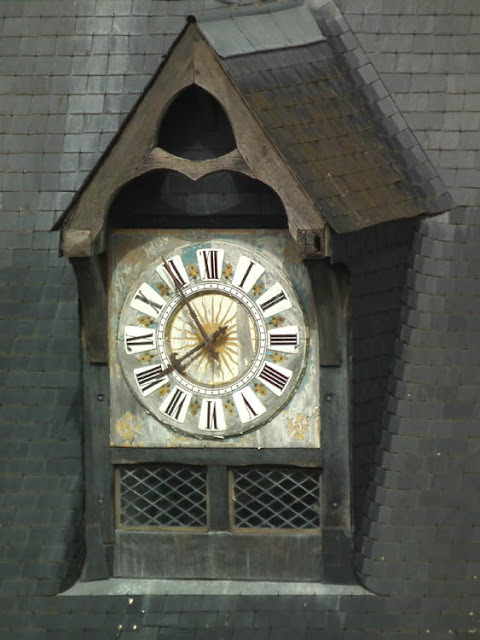 This is what the clock tower looks like photographed from the terrace by the Logis royal. 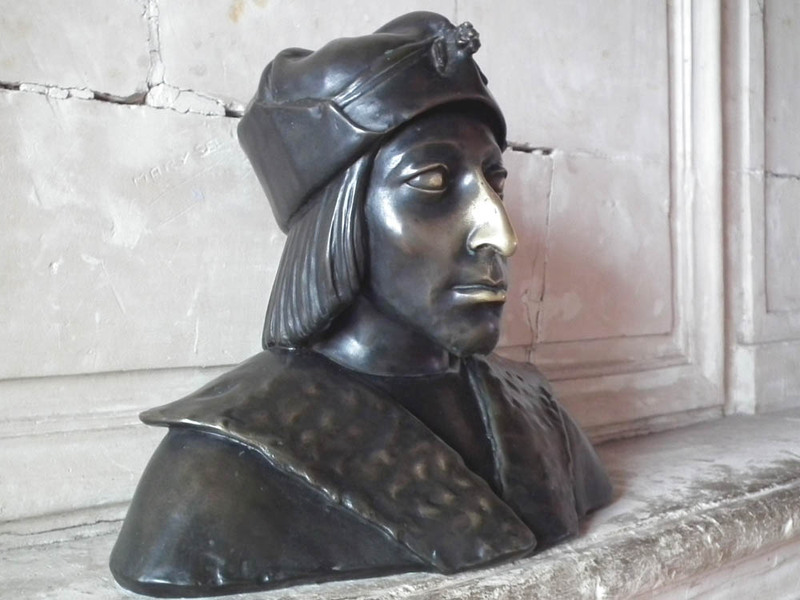 He might not have been as dim as everyone suggested however, as once he reached his majority he pulled off an audacious and advantageous marriage. At first he allied himself to the Holy Roman Emperor Maximilian I of Austria, by becoming betrothed to one of his daughters. But when Maximilian was married by proxy to the child duchess Anne of Brittany, Charles and his advisors knew they needed to act decisively if France was not going to end up as the ham in a sandwich formed by an independent Duchy of Brittany to the west and Austria to the east. Charles laid siege to Rennes, and when Maximilian did not come to Anne's aid, Charles knew he had gained the upper hand. Escorted by troops to 'ensure her safety' Anne was 'persuaded' to come to Langeais castle, where she and Charles were married. The 14 year old Anne was not a happy bunny and famously brought two beds with her to Langeais for the wedding. Poor little Margaret of Austria can't have been a very happy bunny either, as she was left hanging around the French court for years before she was finally returned to her family. Later in the day Simon's brother and sister-in-law arrived and he made a fougasse and barbecued a chicken marinated in his chillicherry sauce. 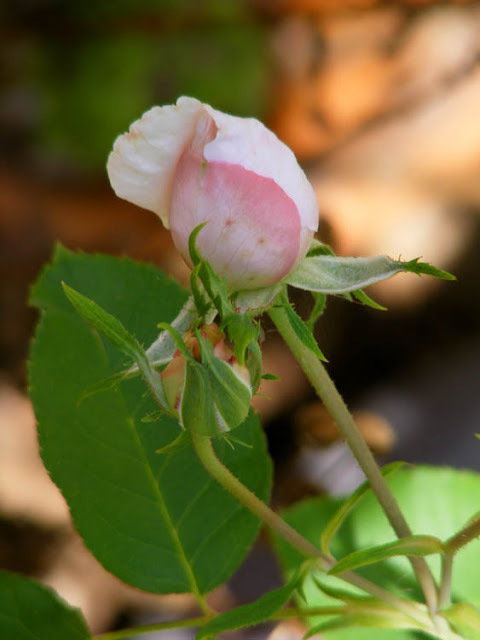 A couple of years ago our seriously green thumbed friend and neighbour Sylvie did a rose propagation workshop at the Chateau of Azay-le-Ferron. I was the lucky recipient of one of the cuttings she had taken from the chateau's rose garden. Ever since it has lived in a smallish plastic pot and moved around the garden and courtyard, developing roots and growing a bit. 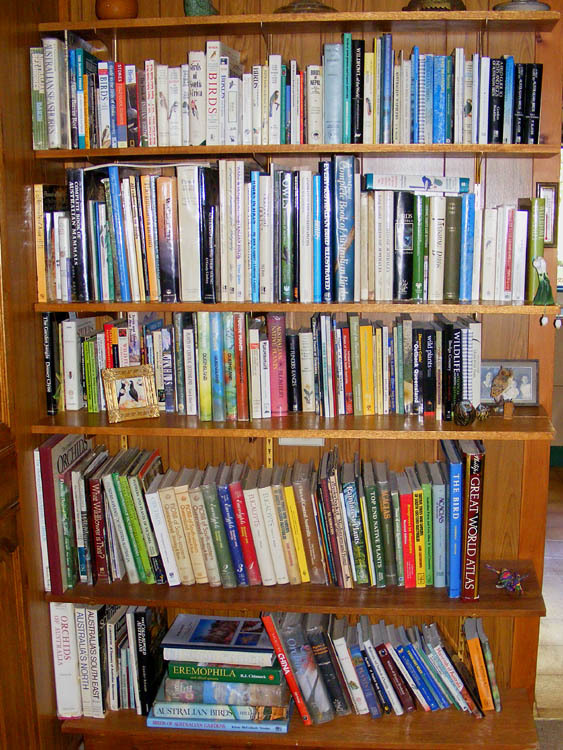 My attention to it has be shamefully intermittent, but it has survived several cold winters and some hot dry weather. It's clearly indestructible. It's also beautiful. This year I potted it up into a really big pot and it has put on a lot of growth and flowered for the first time. 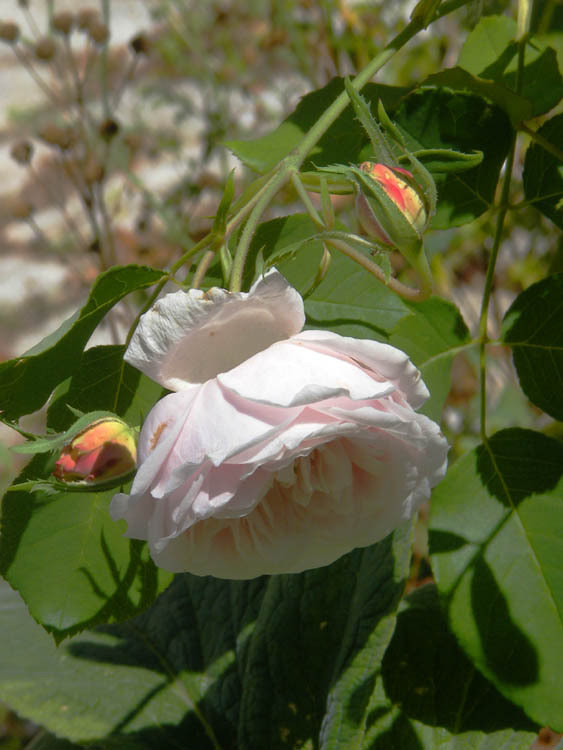 The flowers are the palest palest pink (or white with a pink blush in rose speak). It has the most glorious scent. I am delighted with it, and impressed by its tenacity as well as its outstanding all-round rosiness. Sylvie told me when she gave it to me that she couldn't remember what it was called. 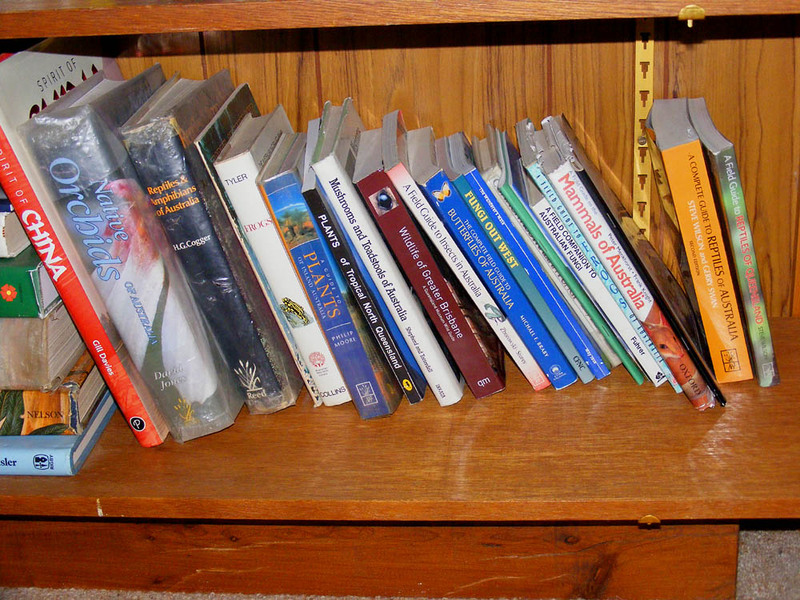 I've consulted some books and I think it might be a centifolia of some sort, but rose taxonomy is a black art, and I am by no means sure. Anyone who has any idea what the name of my lovely rose is please speak up! 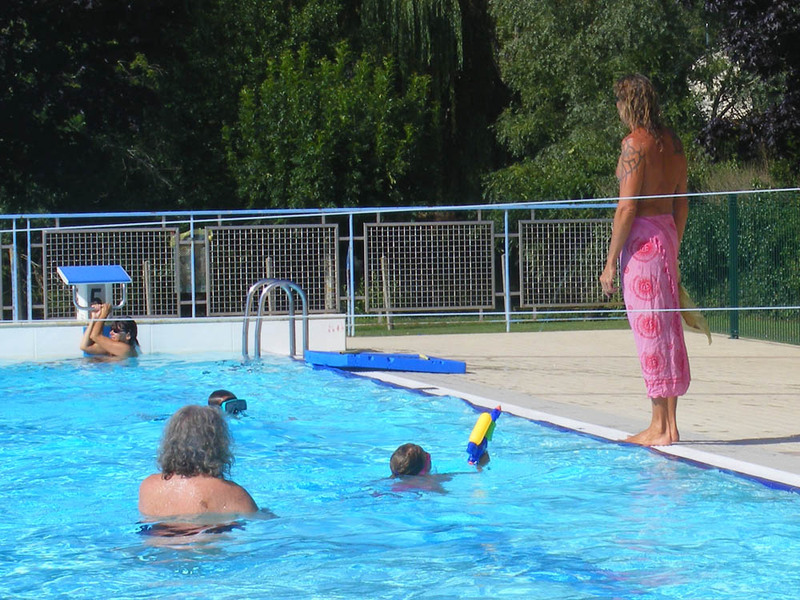 We are getting quite a lot of swimming in at the moment, with nearly daily sessions at the public pool in Preuilly. Recently we learnt that it will be Laurent's last season as the maître-nageur here, as he is going to take a year or two off work 'to make a new life for himself'. We wish him well on his new adventure, but we will miss him. He's here until 1 September, then the pool closes until next year. Laurent on the left and Huub on the right, below. Huub is wearing his special go faster swimming trunks, designed by him and his associates. They specialise in triathlon suits known as Huub Tubes (as seen in this video worn by Jenson Button and his mates). Simon, below left, encouraging Anneloes to behave badly. And what is the best thing about spending the summer in France according to a 7 year old? Swimming with Simon! Yay! 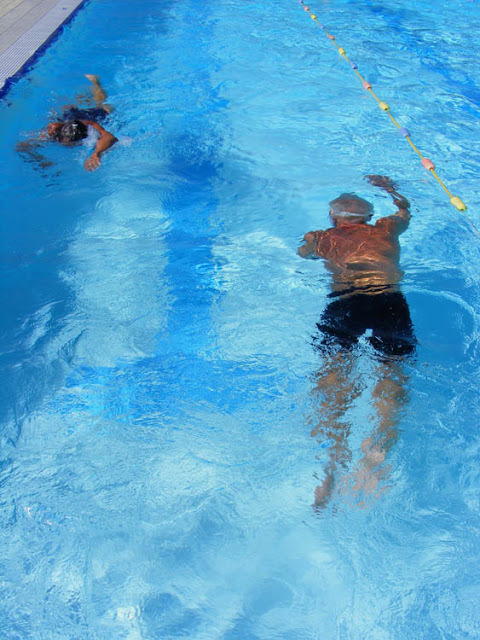 Swimming lecturer Ingrid and swim scientist Huub show everyone how to do it. One day in early August, on our way home from le Blanc we decided to stop off at the river in Fontgombault. It was so hot we took off our shoes and dangled our feet. The water was cool and refreshing, and we were in the shade of a tree. 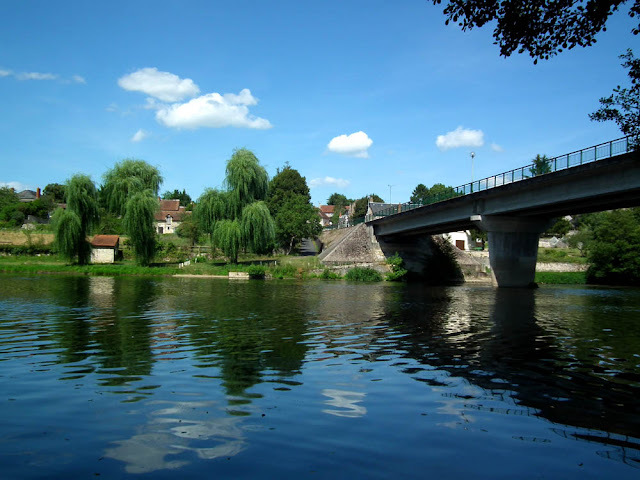 The bridge over the Creuse at Fontgombault. Looking across the river to Fontgombault. 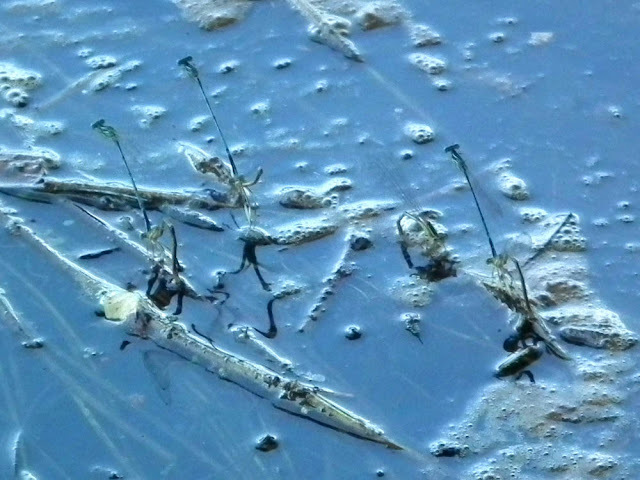 Blue Featherleg Platycnemis pennipes damselflies ovipositing in the river. The males 'stand guard' over the females, who they have grasped by the scruff of the neck with the claspers at the tip of their abdomen. They look like circus acrobats. 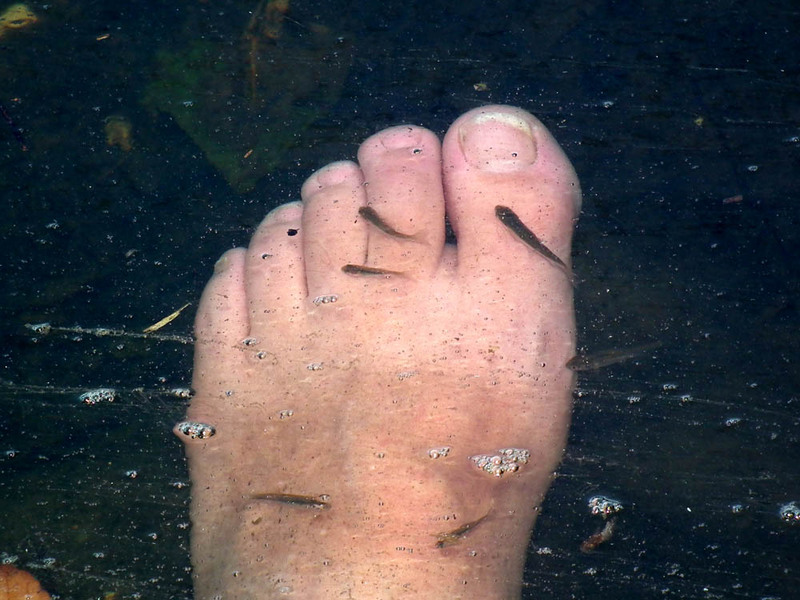 Simon receives a fish pedicure from some bold little fish in the shallows. I very inelegantly hitched up my smart pencil skirt in order to dangle my feet. 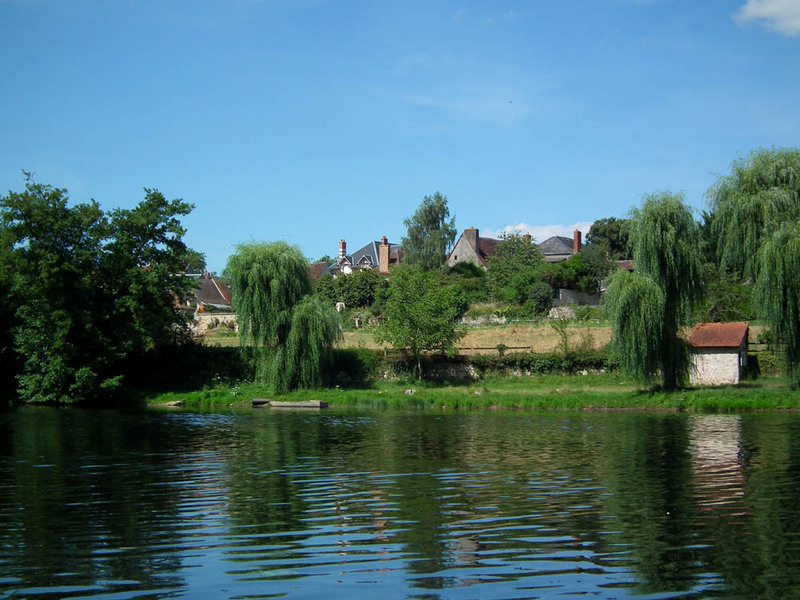 The view over the Creuse.